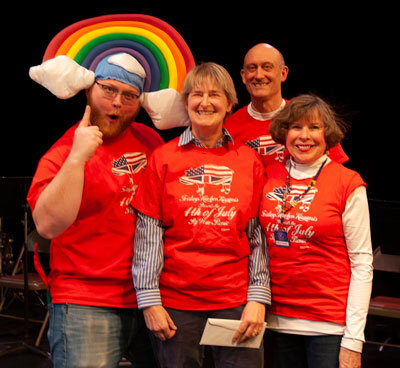 After the Friday Harbor Kiwanis team finished in second place in the 2018 Knowledge Bowl, team member Brandon Cadwell immersed himself in the game show Jeopardy to prepare for the 2019 competition. It paid off as the team - Cadwell, Nancy Fusare, Beth Eden, Lowell Jons - won the 25th Annual San Juan Public Schools Foundation Knowledge Bowl. 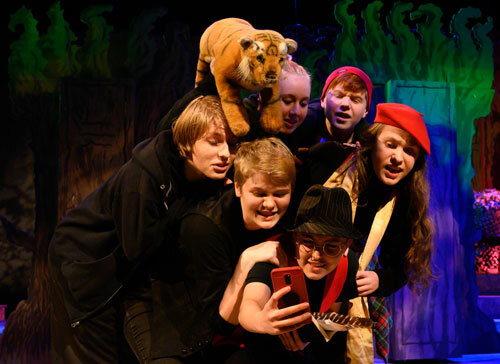 Friday Harbor High School students add their own twist to "A Midsummer Night's Dream"
Friday Harbor High School Drama Group presents "A Midsummer Night's Dream" Thursday, January 17-20, 2019. The drama group under the direction of Jenni Merritt added some modern twists to this classic tale. 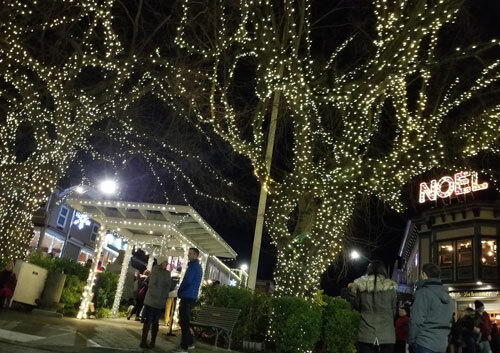 The Town of Friday Harbor sparkled with holiday lights again this year. Festivities kicked off with the Festival of Lights tree lighting sponsored by the Chamber of Commerce, The Whale Museum and Island Rec. Village at the Harbour welcomed crowds to their Holiday Open House. Santa showed up at several events. The Farmer's Market celebrated the season. 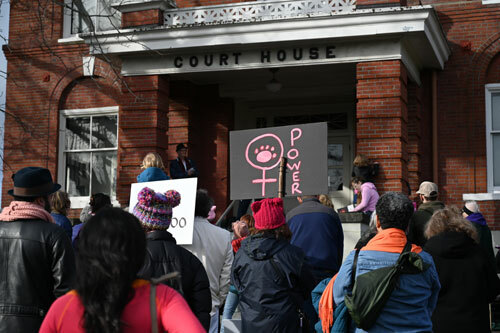 Signs, songs and speakers - it was the third Annual Women's March in Friday Harbor. About 250 people gathered to listen and to march on Saturday, January 2019. Former San Juan County Commissioner Rhea Miller was the main speaker. After Miller's speech, Sharon Abreu from Orcas Island led the crowd in singing a new song by Susan Osborn entitled "Chain of Life". 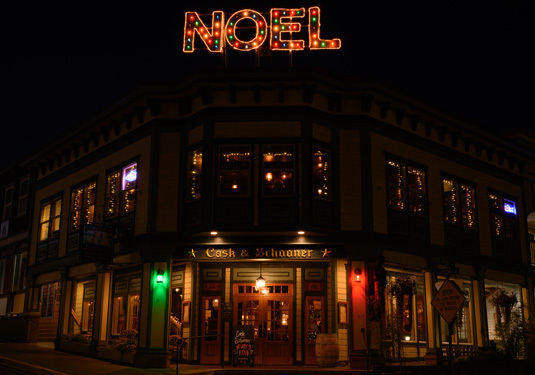 Friday Harbor sparkled with a myriad of holiday lights throughout the month of December. Festivities at Brickworks, The Whale Museum, Village at the Harbour and at Memorial Park were just some of the activities. Santa made several appearances. We hope you enjoy the slideshow. 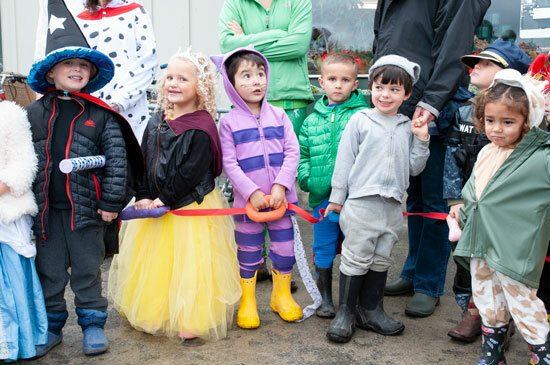 Kids from Lighthouse Preschool enjoyed watching the bigger kids parade by. 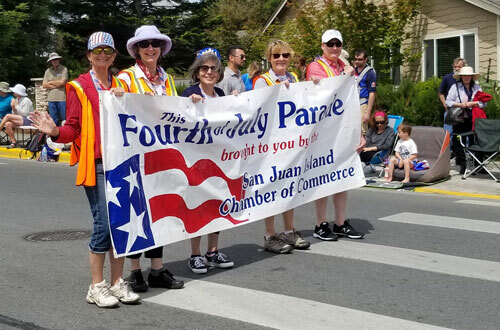 We've posted slideshows of the Friday Harbor 4th of July Parade, the prize-winners, and the Pig War Picnic. 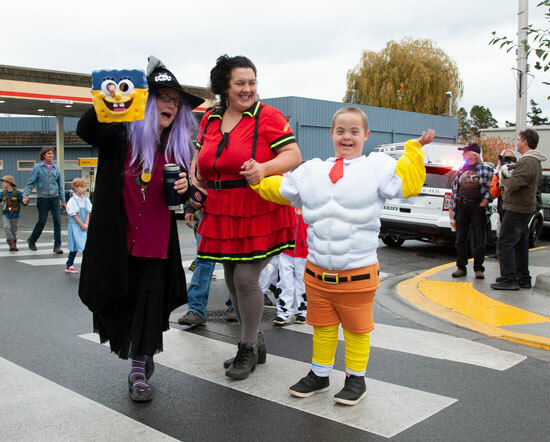 Here's one last slideshow of the crowds watching the parade. Scroll down for our favorite video from the parade - the Seahawks Blue Thunder drum line. 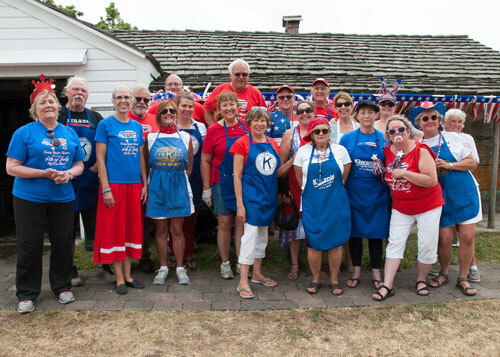 The San Juan Island Kiwanis hosted the annual Pig War Picnic right after the 4th of July Parade in Friday Harbor. Islanders and visitors gathered on the grounds of the San Juan Historical Museum on Price Street. 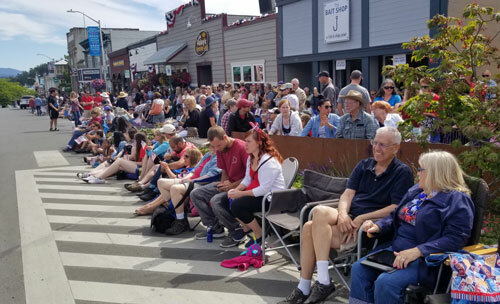 Friday Harbor's 4th of July parade was emceed by Alan Budwill, STAR 101.5 morning show host, and started with a flyby of Island Air Ambulance planes. Seventy-three entries traveled slowly down Spring Street which was lined by crowds of visitors and residents. Video of American Legion Post 163 Firing Squad at bottom of page. 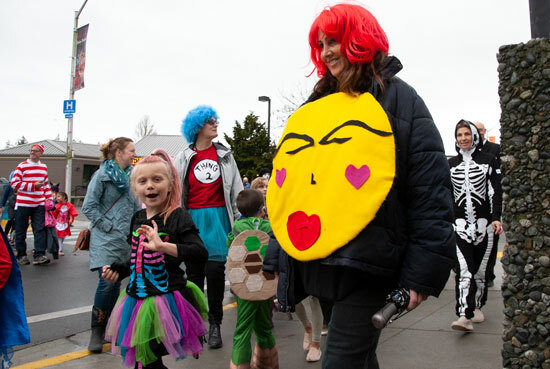 San Juan Island Chamber of Commerce organized the parade and awarded eight cash prizes. Martin Clunes, star of Doc Martin, is filming a documentary in the islands. 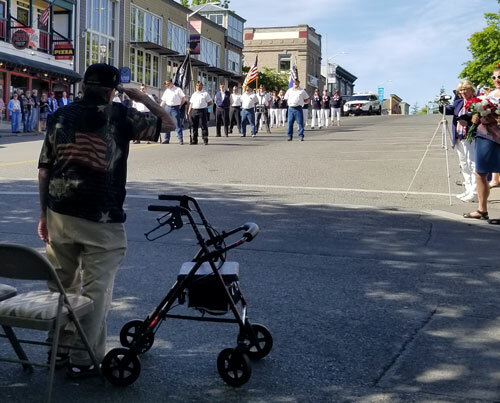 He and his film crew were at the Friday Harbor 4th of July parade. 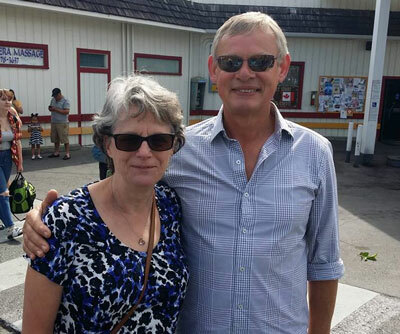 Doris Shaller and Martin Clunes in front of The Little Store in Friday Harbor. 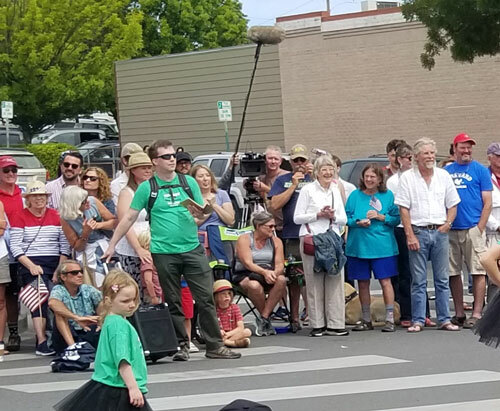 Film crew (center back) at the 2018 Friday Harbor 4th of July Parade. 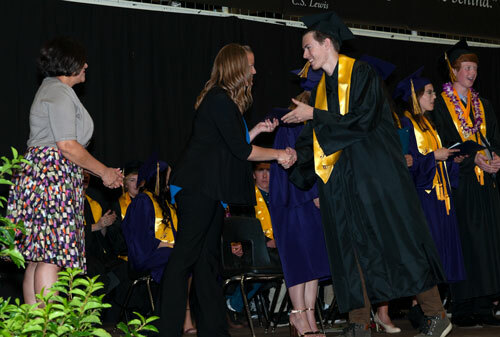 Fifty-five students graduated from Friday Harbor High School Saturday, June 0, 2018. With a C.S. Lewis quote on the backdrop - "There are far, far better things ahead than any we leave behind" - the class participated in the traditional graduation traditions. ASB President Hallie Hargrove welcomed everyone. 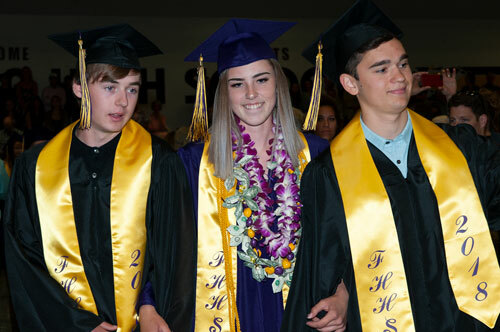 Emma Carpenteria took everyone through the class history detailing when each student joined the Class of 2018. 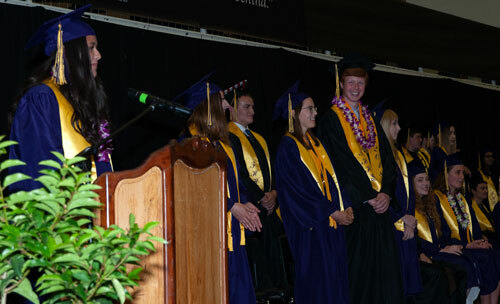 Class Salutatorian Laurel Robertson gave a speech entitled "How Far We've Come", valedictorian Zach Fincher's speech was called "Island Life." The community showed its outstanding support of education as it took about an hour for dozens of scholarships to be presented. 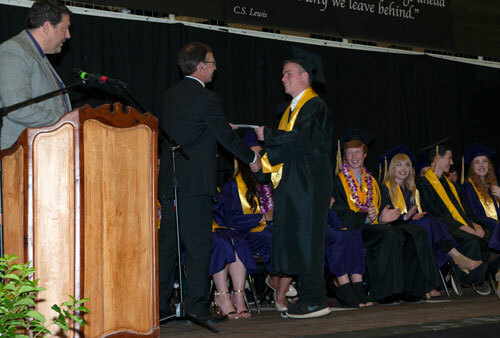 Friday Harbor High School Principal Fred Woods and counselor Gordy Waite handed out a series of scholarships before representatives from local businesses and non-profits took the stage and awarded more. 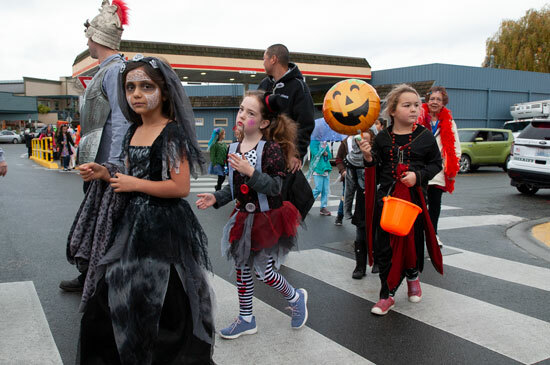 The slideshow drew the usual cheers as photos of each student as a child and young adult were shown on the large screen accompanied by a lively and poignant soundtrack. Then it was time for the diplomas. Woods, Superintendent Dr. Danna Diaz, and School Board member Sarah Werling-Sandwith handed out the diplomas and shook the graduates hands. Woods' daughter Kiana was one of the graduates. A very short video of the graduates throwing their mortarboards is posted at the bottom of this article. 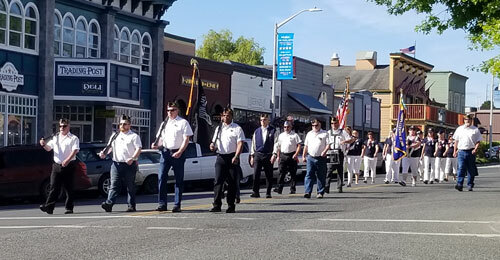 Under sunny skies, the American Legion Post 163 Color Guard, Firing Squad, Auxiliary and Our Lady in Mourning (Lynda Guernsey) representing all the widows marched from Court Street down Spring Street in Friday Harbor. The annual Memorial Day parade was followed by the ceremony at Memorial Park. 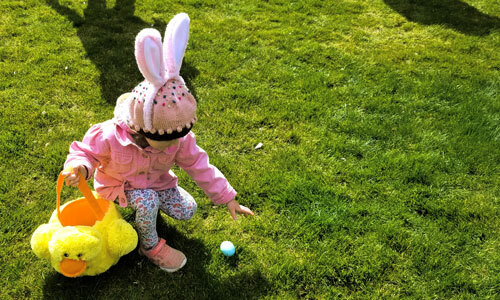 San Juan Island Firefighters Association hosted their annual Easter Egg Hunt at Jacksons Beach Sunday, April 1, 2018. 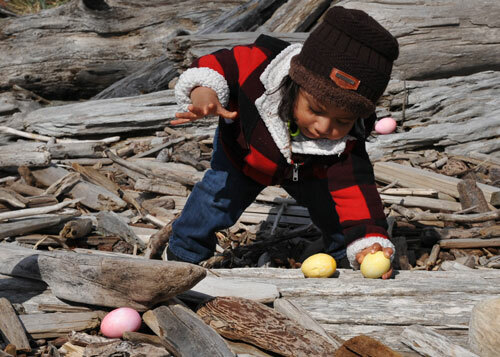 More than 1,500 eggs, dyed at the fire station on Friday night, were hidden on the driftwood-strewn beach.